LOWELL, MA - The Lowell Spinners, proud affiliate of the Boston Red Sox, today officially announced their 2019 schedule. The campaign kicks-off at home on Friday June 14th with the first of two games against the Connecticut Tigers (affiliate of the Detroit Tigers). 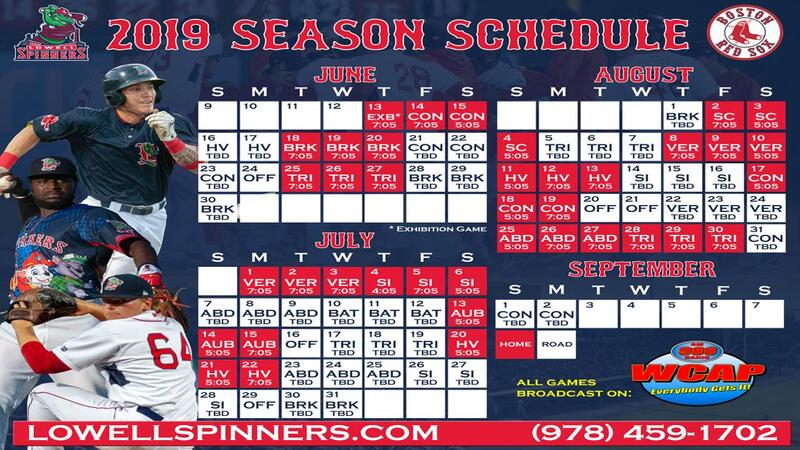 The Spinners' home schedule at LeLacheur Park, features 61% of their home games being played on premier dates (Thursday through Sunday) in 2019. At the request of our fans, start times for weekday Spinners games will revert back to 7:05 PM while weekend dates will now begin at 5:05 PM. A special home game on Independence Day, Thursday, July 4, will begin at 4:05 PM and will be followed by the annual City of Lowell fireworks that evening. The Spinners annual "Kids Camp Day" will be Tuesday, August 13th at 11 AM. The rival New York Yankees affiliate (Staten Island) make their only visit to Lowell on Thursday July 4th and stay through Saturday July 6th for the first ever "Yankee-Doodle Weekend." More details will soon be forthcoming. The Spinners' staff is currently planning the 2019 promotional calendar; the full list of promotions will be released in the coming weeks. For 24 seasons, the Lowell Spinners continue to be the proud short-season affiliate of the 8 time World Champion Boston Red Sox. All inquiries should be directed to media@lowellspinners.com.